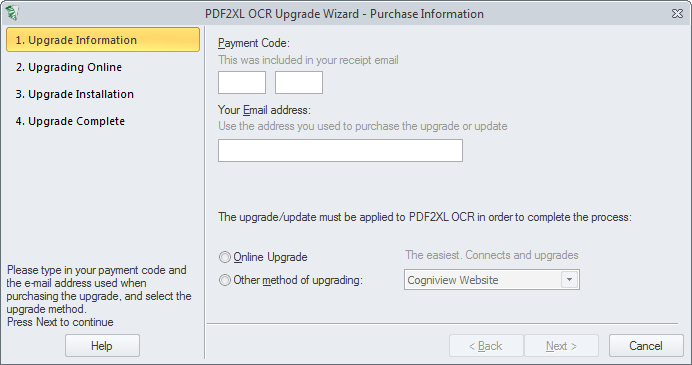 While it's always possible to go on Cogniview's site to upgrade your PDF2XL Enterprise license, you can also upgrade from within the program itself. 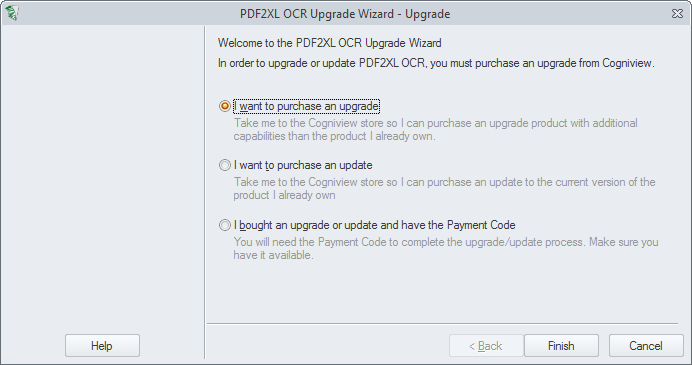 The payment code is the one that belongs to the upgrade, and not the same one you used to activate PDF2XL Enterprise originally. You can find it in the purchase confirmation email that you received after buying the upgrade. Much like in the activation, if the computer is connected to the internet then PDF2XL Enterprise can connect to Cogniview's server and apply the upgrade automatically. If your computer is behind a firewall that blocks this kind of operation, you can also apply the upgrade via Cogniview's website.